During recent editions of the Monaco Yacht Show, while the eyes and desires of wealthy visitors were riveted on the exhibition of 120 superyachts in Port Hercules, a quite different show was habitually on display in the streets of the Principality: a magnificent parade of prestige limousines ferrying the show’s VIP clients between the MYS and the luxury hotels of the Principality. 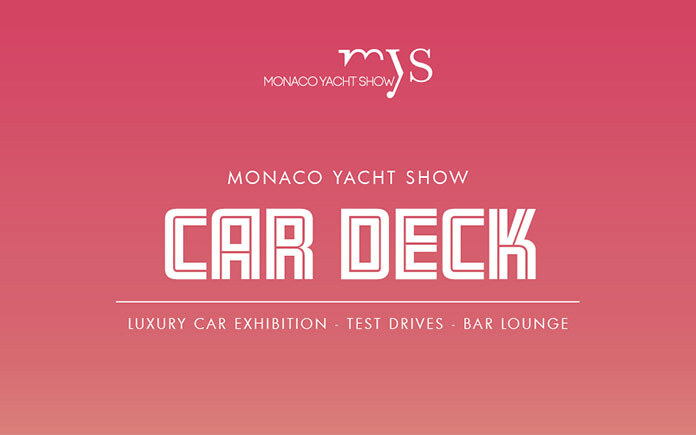 As a logical follow-up to the presence of these automotive brands in the MYS and their express desire to be associated with the show in recent years, the organisers will launch a totally new exhibition space dedicated solely to ultra-high-quality vehicles during the 2016 Monaco Yacht Show: the Car Deck. Installed on Quai Rainier III in Port Hercules alongside the largest yachts in the show, the Car Deck will offer all visitors and exhibitors access to a 230 m² indoor bar-lounge, while outside prestige cars will be on display, available for purchase or a test drive in the heart of the town. The launching of the Monaco Yacht Show’s new exhibition area for prestige automobiles is an integral part of the development strategy implemented three years ago to further enhance the show’s ultra-high-level offering and thereby attract a new wealthy audience, both regional and international, to the quays of Port Hercules.